Right now we are in the heart of football play-offs. Our weekends are being consumed by football (not a bad thing in my book although I wish my team was in the play-offs but that is a whole other post to rant about). My husband on the couch, me in the kitchen, and every now and then we make a trip over to our neighbors home. If your like me you are in constant need of food storage containers. I’m constantly having to battle our food storage container cabinet to find what I’m looking for. Well, those days are over my friends. Target and Rubbermaid are here to help you get organized with the Easy Find Lids and get ready for the big game with convenient Take Alongs that enable you to create winning food spreads with ease. Now, let’s talk more about the food. You can’t watch football without chicken wings. It is just un-American. My husband happens to LOVE chicken wings. He is kind of a chicken-wing connoisseur of sorts. Me on the other hand… not a huge fan. I kind of find them barbaric. I would much rather prefer the boneless type (aka chicken strips) then on the bone. But because I love my husband I feed his frequent desire for chicken wings. I just so happened to have some queso fresco cheese on hand and I always have green onions readily available thanks to my bountiful garden so this was kind of a no-brainer. I love the idea of baked chicken wings. No need to get out the deep fryer and clog arteries here. Within 30 minutes you have healthy-ish chicken wings. Trust me–my husband didn’t miss the greasy fried wings. I would also like to add that he still managed to get just as messy but thankfully not as greasy with this version. I served up the wings with some ranch sauce and celery sticks. This entire meal pack-ups beautifully in my new Rubbermaid TakeAlongs! While the oven is preheating, arrange the chicken wings on a baking sheet. Sprinkle with salt to taste. Bake the chicken wings for 40 minutes or until golden brown and internal temperature reaches 165 degrees. Carefully remove the chicken wings from the oven once they are done cooking and place into a large bowl. Pour 1/3 cups buffalo sauce over wings and toss until evenly coated. 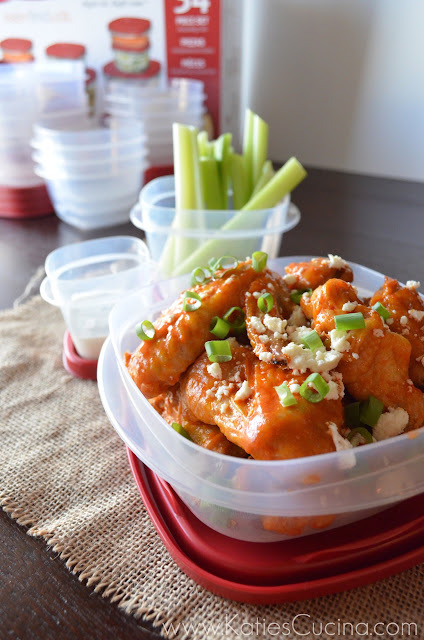 Place chicken wings on a serving dish (or Rubbermaid Food Storage Container) and sprinkle with crumbled queso fresco and thinly sliced green onions. Disclaimer: this was part of a sponsored post for Rubbermaid back in 2013! As always all opinions are my own. These look yummy Katie! 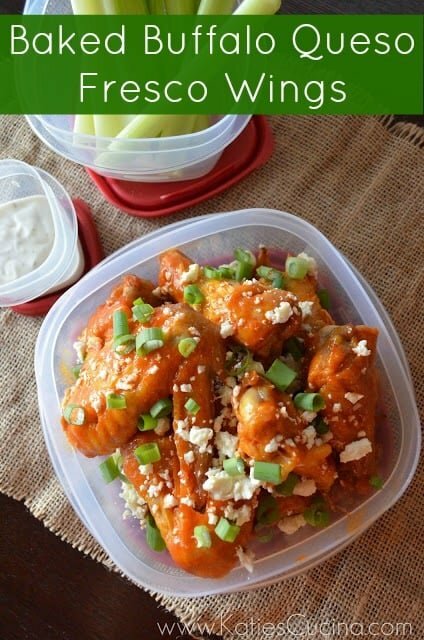 We love chicken wings at my house so I am definitely going to try these! Thanks Kelly! These are great and the best part is that you won’t feel too guilty eating them since they are relatively healthy! These look great! I love that they are baked. Buffalo wings are a guilty pleasure for me for sure! These look GORGEOUS and I love subbing queso fresco for the traditional bleu cheese. GAH! I want to eat a dozen of these bad boys right now! Gorgeous pics, Katie! Um yeah…these look awesome…its wings season by far. Love those containers too.